Budae-jjigae (부대찌개) simply translated means army base stew. As a dish it originated soon after the end of the Korean war. At a time when food was scarce in Korea people started to use surplus food from US army bases such as spam, hot dogs and sliced ham. 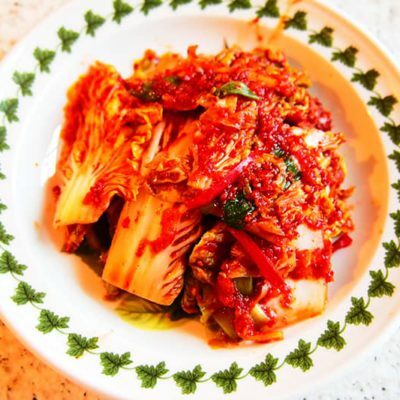 Combined with typical Korean ingredients such as gochujang (red chilli paste) and kimchi (spicy fermented cabbage) a simple, cheap, but tasty dish was formed. Budae-jjigae is a perfect example of fusion food and is still popular today in Korea. It’s also a particular favourite in my house. If my son had his way we’d probably end up eating this 4 times a week! Over the years the type of ingredients that people have used in this dish have expanded to include things such as sliced cheese, tofu, mushrooms and even baked beans! The opportunity for creativity really is there with this dish. Feel free to experiment. The recipe I use is something that fits my family’s taste but if you can’t find any of the ingredients just swap them for something else. There is no real right or wrong! Start by slicing the spam, frankfurter sausages, tofu, mushrooms, spring onion and onion. Discard the flavouring from the instant noodle pack. In a bowl add all of the ingredients for the sauce and mix well. Add the chicken stock to a large, heavy pan and bring to the boil. Once boiling add the sauce to the stock and mix well. Bring back to the boil. Add all of the remaining ingredients to the pan except for the instant noodles and the spring onion. Keep over a medium heat for 15 minutes. Add the instant noodle block to the pan and continue to cook for a further 5 minutes. Remove the pan from the heat, garnish with the spring onion, place in the center of your dinner table (on a coaster!) and enjoy with a side bowl of fresh rice.